Well, it took them long enough. The first so-called “major revision” in the tax code in roughly 30-years. Jason touched on this a little earlier with the statement released by Chairwoman Romney-McDaniel. Speaking for myself, I’m going to hold off final judgment until I get a chance to read exactly what was in final bill. On the plus side, at least it doesn’t touch the continuing resolution. But where I want to go with this is a little differently from where I have gone with in the past. This time I’m going to focus on the other side…Team “d”. Not so much in what they have said, but in what they are doing. Or, more specifically, not doing. Let me start off by saying that I get correspondence from various elected officials on the other side from time to time. Studying the ways of ones enemy, that sort of thing. Most of it is repetitive (obviously), but very rarely is it timely. 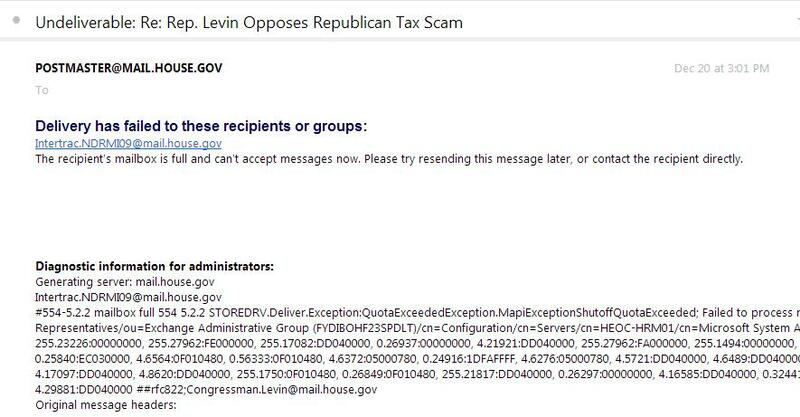 Yesterday I got something from Sander Levin’s office regarding the tax cut which stood out not by just the timing, but his blatant insincerity as well. “In all of my 35 years in Congress, this is one of the most deceitful bills I have ever seen. It is deceitful when Republicans say the bill is focused on the middle class, while it’s really aimed at making the very wealthy even wealthier and forcing millions of middle class families to pay higher taxes. It is deceitful when they say it makes the tax code simpler, even as the legislation creates complicated new loopholes, while allowing existing ones, such as carried interest, to continue. It is deceitful when the bill will increase the outsourcing of American jobs by providing a lower tax rate on foreign investment compared to investing here. It is deceitful about the debt. Republicans say don’t worry about the expiring tax provisions, but extending them would raise the bill’s already devastating effect on the deficit to $2.3 trillion. After reading his diatribe, I decided that I’ll bite. I’ll call his office and ask him when did he ever introduce broad-based tax relief for American Workers. For good measure, I’ll ask him where he was during the previous administration when a certain Chicago Street Hustler took it upon himself to double the national debt. So I dialed his office yesterday afternoon. The phone rang, but no one answered. Second attempt, the phone rang, but still no one answered. I didn’t have all day to wait for someone to answer, so I just replied to the e-mail that was sent to me. After a few minutes, I got a response back. It was one that I didn’t expect from someone who purportedly has the pulse of those he represents. The screenshot is below. His actual address is at the bottom. Try it out for yourself to see how long it takes you to get ignored by a Congressman! So, not only do the democrats like to repeat the same talking points over and over again amongst themselves, but they won’t even accept anything from outside of the Team “d” party apparatus. Just something to keep in mind the next time a democrat claims to actually represent the people. Listening to the same voices over and over again just isn’t the same!